Introduction: Since most fly-fishermen practice catch and release the majority of the time they are on the water, selecting the proper net for this practice is essential. There are many different landing nets on the market that are comprised of many shapes, sizes, and materials. Brodin makes a variety of fishing nets that can match up with any angler�s type of fishing. Net Opening 10" x 15"
Impressions: Streambase Model Nets by Brodin are great nets for landing and releasing fish. They are quite a bit cheaper than traditional nets, yet are still durable enough to handle strenuous fishing environments. We take a look at the Trout Model net by Brodin to see just how good it is as an all around net for catching and releasing River Trout. The field tests: When I first used this net I was very impressed with how comfortable it was while on my back. Unlike many nets it is not cumbersome and annoying. Its large gap mesh material allows you to hold the fish in the net, without taking off the fishes protective slime layer that is essential for swimming and fighting off disease. You can actually release your catch easily without having to take the fish completely out of the water. 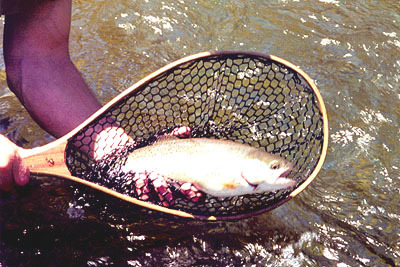 Steambase�s Trout model net is not enormously deep in mesh material. This helps you remove the hook from the fish�s mouth while it is in the net. With other nets that have a very deep mesh pocket you to remove the fish from the net in order to get the hook out of its mouth. The more handling a fish requires to release, the lesser its chances of surviving. 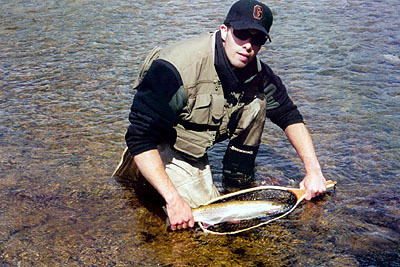 Streambase nets also allow you to hold the fish with the large gap mesh material, without hurting it. I was also surprised at how durable this net was. It is comprised of Cristobal wood, which is very strong, yet very light. The interior mesh is stitched once every inch of the inside base of the net. This makes the weight capacity of the net very strong. This is a big plus if you happen to land that big lunker. The only problem I ran into with this net is the hooks getting caught in the mesh material. This problem occurs whenever you use mesh nets, and the hook falls out of the fishes mouth while it is in the net. The best way to avoid this problem is to use a rubberized net instead of mesh. Brodin offers this option on some of its nets if this problem gives you too much grief. Otherwise, just allocate a bit more patience as you take time to remove the hook from the mesh with a pair of forceps. Conclusion: All in all, the Streambase Trout model net incorporates all the characteristics a good catch and release net should have. 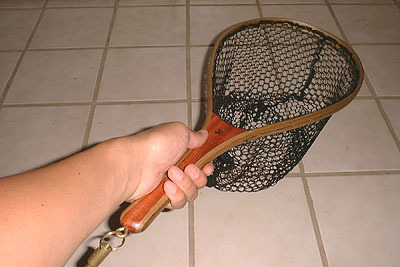 A large net opening diameter, not to deep of a mesh pocket, a strong cristobal wood material, and an easy release clasp. This clasp can actually be upgraded to Brodin�s Quick Pull Clasp. This allows you to release the net from your vest with one quick pull. I highly recommend this add-on if you want the easiest access to your net. Cost for Quick Release $15.99.